Ugly Overload: Why the Long Tongue? 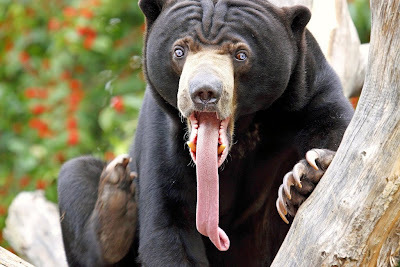 The sun bear is called basindo nan tenggil in Malay, which means “he who likes to sit high." That's because, as the smallest of the world's eight bear species, the sun bear is able to clamber high into the trees, where it spends most of its nocturnal life. Why the long tongue (and long face, for that matter)? That pink ribbon allows it to lap away at honey and insects deep inside trees that it has torn open, spots where those of us not so endowed aren't able to reach. Winnie the Pooh could have used a tongue like this. Though, that may have hampered the show's success. love this blog. keep up the good work, guys!